With all of the unrest in the Middle East, one has to be able to count on journalists for the most up to date information. Being so far away from somewhere makes it very difficult to stay connected with what is going on and in the cases of Egypt and Libya what happens there affects the rest of the world. There is one journalist who I can always count on to provide me with clear and up to date information on complicated foreign conflicts. 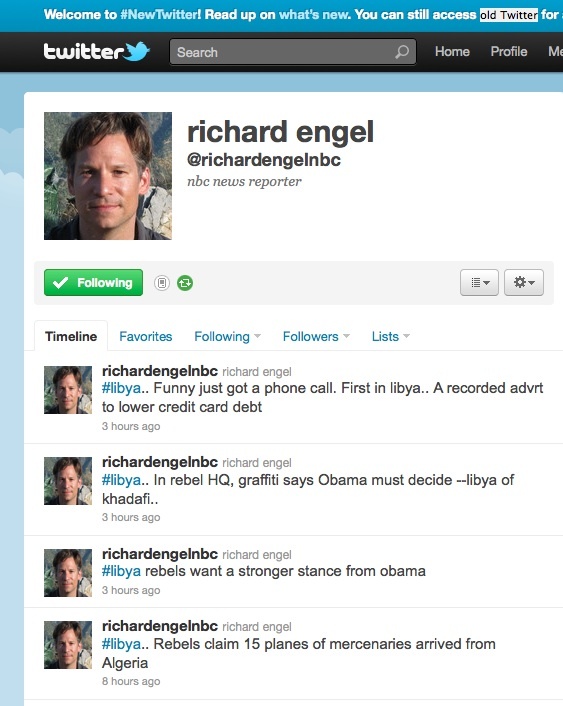 Richard Engel. He doesn’t just report it, he’s there. Every recent conflict, he’s been there. He knows these countries inside and out as well as what we need to know here in the US. His twitter page is how I’ve been able to keep up with first Egypt and now Libya. The ability to report instantaneously on location has totally changed the way we cover major crisis. We can now know developments as they happen not just when we are able to get them. We are more connected to these crisis then ever and with that comes major responsibility. With so many reporters be hurt or attacked abroad, one has to wonder if it’s all worth it. But the truth is it will be. Maybe being aware of these issues as they happen will make a difference in the way we as a country deal with them. More knowledge may create more understanding. At least we can hope. The major challenge I faced in my reporting lately is time. I feel like I am constantly battling the clock, my calendar and circumstance to produce a quality product. My story I turned in for class this week at first I was completely ashamed of. I had only so much time with the camera and only so much time to put the story together. It did not come out the way I had wanted it to or the way I had planned. I was so disappointed in myself. However, I did finish it. Although it may not have been the best I can do, I did something. I took all the time that I could afford and made my best effort. That means something to me. No matter what grade I get on the package (I know it won’t be good) I’m just glad that I was able to make something out of what I had. I had a story. It wasn’t the best. I overcame my mentality and just pushed through it. If I can do that, then dealing with the time crunches and balancing act of other classes and work will come. As long as I keep pulling something through then I will be able to get the most out of this class, whether it is an A or not.